In his 1857 Realist painting, The Gleaners (Des glaneuses), Jean-François Millet portrays three peasant women picking up any leftover pieces of wheat after a harvest. 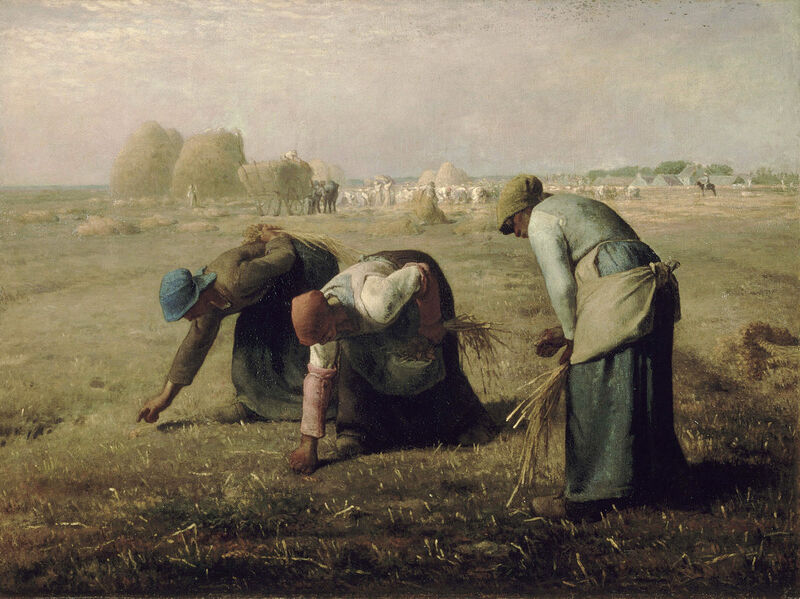 The gleaners were the lowest of the low in French society, and the painting was received with criticism and suspicion from the middle and especially upper classes for Millet’s dignified if not sympathetic portrayal of the lower class. We never see the faces of the women; they are too concerned to pay attention to us spectators. They must glean or go hungry. Their arched backs keep them close to the earth, but never rising high enough to meet the horizon and enjoy the bounty of the wheat harvest piled behind them. Millet paints them lest we forget one’s humble status.